Every other Tuesday, Pastor Laura visits the CDC to share a Bible story with the children. Something good is happening just about every single second of every single day at St. John’s CDC, so let’s hear about some of that good stuff! Pastor Laura Henrik comes to visit: Every other Tuesday, Pastor Laura comes to our CDC. While she is there, she shares a Bible Story with the toddlers, and then, she shares a Spark Bible story with the older children. No doubt this is a wonderful addition to each and every child’s experience at St. John’s CDC. We thank Pastor Laura for sharing God’s word with our precious ones. Steve Jarrett improves the toddler playground: Our playground experiences many small footprints, so there was a need in the toddler playground area for some mulch. When Steve and Celia Jarrett heard the toddler children were playing on red dirt, Steve quickly paid a visit to the playground and covered this area with mulch. Our church thanks Steve, and there’s no doubt, these children’s parents are grateful too! 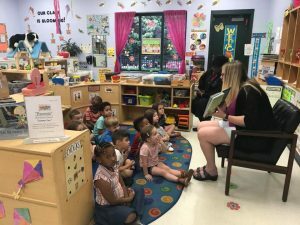 Summer Camp, big time fun: During the summer months, the CDC operates an ongoing summer camp for rising first-graders to rising sixth-graders. What fun they have. Just look at this schedule. Wow! I know these parents are so pleased that their children are actively involved each and every day at summer camp! Wednesday – Field Trips to places like Dan Nicholas Park, Skateland USA, Zootastic, etc. Fun Friday – They may take a trip to Bounce City, tie dye a t-shirt, eat an ice cream sundae and more. A new playground committee has recently been formed: Just as a house eventually needs updating, a playground occasionally needs updating too; so St. John’s has formed a new group that will focus on updating the CDC’s playground. The playground size will be increased; it will be new and improved with splashes of creativity. How exciting! There will be more news to come about this adventure for our Child Development Center as the project plans progress. Want to help make sure many good things continue happening at our CDC? Then keep reading to discover just how you can help. You may donate to St. John’s Lutheran Church, writing CDC scholarship in the memo line. 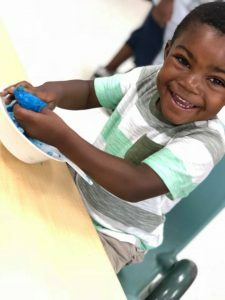 If you would rather make an impact by shopping for the CDC, here are some needed items: toddler board books, soft dolls, bubbles, sidewalk chalk, construction paper, and balls for the playground. You may want to directly impact the children’s lives like Pastor Laura. In that case, let the administrative staff know you would like to read a story, share a song, create a craft… Their number is 704-636-6756. Get more involved in St. John’s CDC, and there’s no doubt good things will keep happening there.